This metamorphosis is easily achievable by doing just one thing: roasting the garlic. Start by preheating your oven to 400° F. Remove any loose layers from the outer head of the garlic, making sure to leave the whole head of garlic intact. Cut off about 1/4 inch from the whole garlic head with a very sharp knife. Arrange the head of garlic cut side up, drizzle with some olive oil and a sprinkle of kosher salt. When drizzling the oil, go slowly so that the oil can actually soak through each garlic clove. 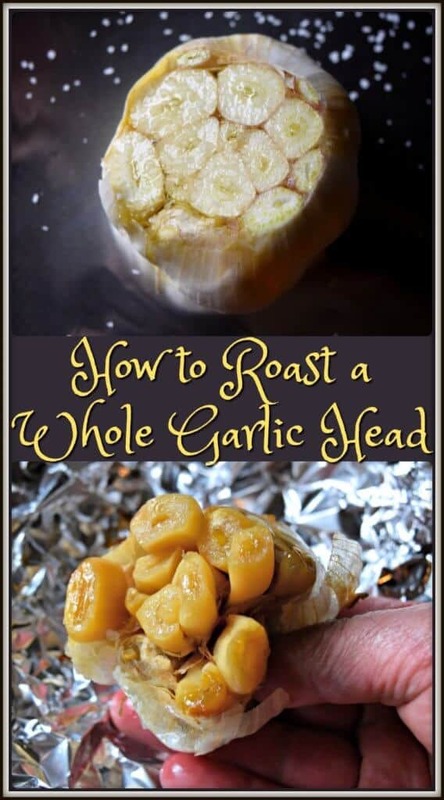 Wrap the garlic in foil and place in the oven for at least 45 minutes. After the 45 minutes, verify whether the garlic is done every 5 minutes or so. Soon, you will begin to smell a wonderfully sweet fragrance! Your garlic is ready when you can pierce the center clove with a paring knife. The longer the garlic stays in the oven, the more intense the flavor becomes. You will also begin to notice some caramelizing. Once you have removed the garlic head from the oven, and when cool enough to handle, grab the garlic bulb from the bottom and give it a gentle squeeze. The cloves should pop straight out of their skin. These aromatic cloves can be kept in the refrigerator for up to 2 weeks or frozen for up to 2 months. And that is How to Roast a Whole Garlic Head! My mom would love to make roasted garlic cloves. They would be used in countless ways throughout her savory dishes. My dad also loved garlic – he would prefer to eat his raw. He would tell us it was good for his health, and of course, he would be right, as there are so many health benefits of garlic. I vividly remember the conversations between my paternal grandparents and my dad as to when the best time would be to plant garlic. Every year, without fail, this discussion took place. Even as a teenager, and especially throughout my young adult life, these animated conversations always intrigued me. After my paternal grandparents passed away, my father continued to follow their tradition: he planted garlic bulbs in the fall, during the waning phase of the moon, in order to have the most fragrant and magnificent garlic bulbs when harvested. A few months ago, my dad was hospitalized. I realized that my dad’s time to plant garlic had come to an end. This fall, I had the garlic conversation one final time with my dad. And so, I found myself researching moon phases to determine when would be the best time to plant my organic garlic. It might be worth mentioning that there are so many reliable sources which report that there is no conclusive evidence showing the validity of so-called agricultural astrology. So really, maybe the garlic conversation that persisted throughout the years wasn’t actually as important as I thought it was, growing up. 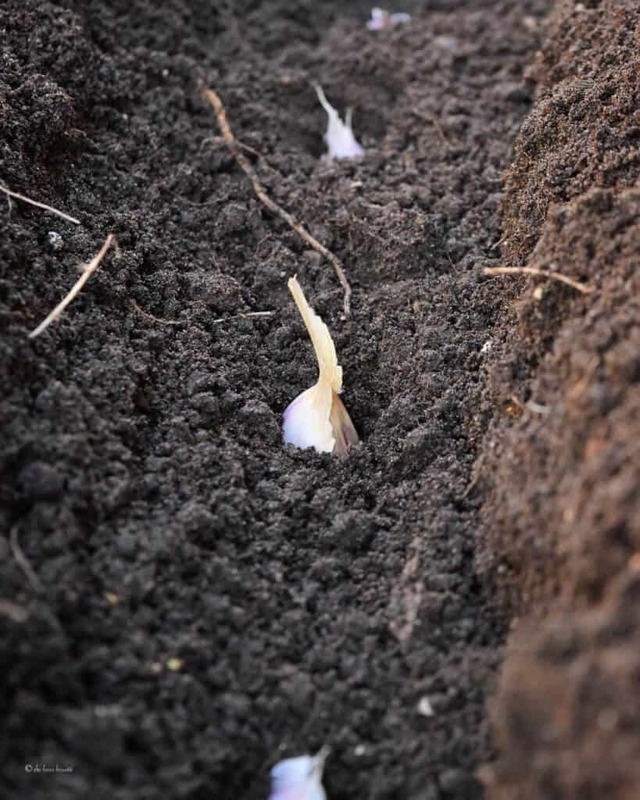 Still, though, I planted the garlic during the waning phase of the moon, to honor my father, and as I did, my thoughts lingered on the changing seasons and I turned to Mother Nature for solace. My father passed away this week, from lung cancer. Reluctantly, we accept. It’s never easy to say good-bye. This post is dedicated to the loving memory of my father. Learn how to roast a whole garlic head to witness the simple transformation from pungent to mellow, bitter to sweet & coarse to buttery in texture. Remove any loose layers from the outer head of the garlic. Make sure to leave the head of the garlic whole and intact. Cut off about 1/4 inch from the garlic head. Arrange cut side up, drizzle with some olive oil and a sprinkle of kosher salt. (When drizzling the oil, go slowly so that the oil can actually soak through each garlic clove). 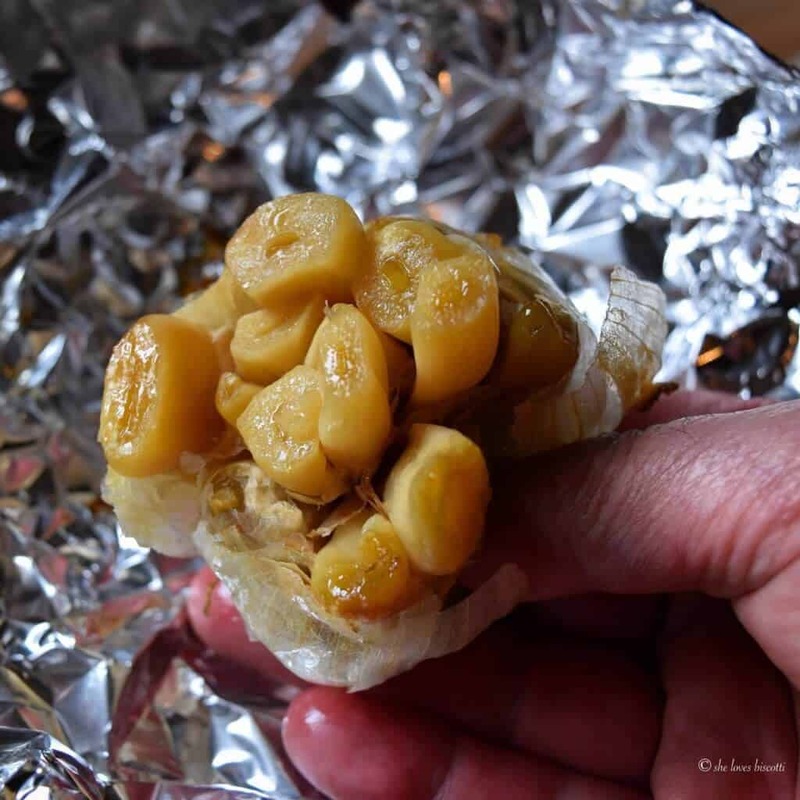 Wrap the garlic in foil and place in the oven for at least 45 minutes. Following this time, verify the garlic every 5 minutes or so to check whether it is done (the garlic is ready when you can pierce the center clove with a paring knife). When cool enough to handle, grab the garlic bulb from the bottom and give it a gentle squeeze. The cloves should pop straight out of their skin. Cloves can be kept in the refrigerator for up to 2 weeks or frozen for up to 2 months. My deepest sympathy to you and your entire family Marie. What a loving tribute this post is to you father. You are in my thoughts…. I just loved roasted garlic. It is delicious by itself or as an addition to so many dishes instantly providing a deeper flavor profile. My deepest sympathy at the loss of your daddy. You are right it is never easy to loss someone we love. I find it particularly hard when it is our one remaining parent. Somehow you realize that you are the eldest generation now and with that comes responsibltes. Now you have to be the wise one, guiding the next generation forth in traditions, memories and role modelling. Thank you for sharing this beautiful story. Quel bel hommage à ton papa. Tu es très courageuse et forte. En écrivant tous ces beaux textes, en publiant toutes ces magnifiques photos, en partageant toutes ces recettes typiques, tu honores la mémoire de tes parents. Ils seront toujours près de toi. Ce matin, j’ai versé quelques larmes en te lisant, je partage ton chagrin et à toi et tous tes proches, j’offre mes sincères sympathies!